Over the Garden Wall; Tommy Suet's Ball; The Cat's Got the Weasel - Jew's Harp; The Outlandish Knight; Henry My Son; Creeping Jane; AII of a Sudden He Stopped; l Reckon I Missed My Chancel - Story; l'm Billy Muggins; The Cuckoo; Ram She Ad-a-dee; Ram She Ad-a-dee 1958; The Children's Home; Seventeen Come Sunday; Seventeen Come Sunday 1958 ; AII Been Havin' a Go; Young Sailor Cut Down; Banks of Sweet Dundee; The Camera Boy; An Old German Clockmaker; The Bramble Briar; PC49; The Cinderella; A Group of Young Soldiers; The Willow Tree; Jack Bostock's Whisky - Story; The Irish Girl; A Drunken Family; lt's A Pretty Melody; Coming from a Music Hall; Barbara Ellen; Christmas Day in the Workhouse; Come Lasses and Lads; Don't Send My Boy to Prison; Down the Road; Flanagan; lf There Wasn't Any Women in theWorld; lt's a Lie ; My Name is John Giles; AII Jolly Good Fellows; Little Fish; McCaffery; Prisoners in the War - Story; Old Mrs Biggar ; Ours Is A Nice House; Pistol - Dreadful OId Joke; Ring Ting-a-ling; l'm Sixty Three; Some Folks Sing Like a Lark; Ten Little Fingers; The Little Shirt My Mother Made for Me; The Agricultural Show; The Circus Tent; The Cobbler; The Mountain and the Squirrel - Fable; The Nightingale; ln These Hard Times; Three Men Went a-Hunting; The Village Pump; The Two Magicians; Wheel the P'rambulator, John; Your Sweetheart Grace; Will the Angels Play their Harps for Me? ; Khaki Trousers; Wheezy Anna. When he announced the publication of this CD, Rod Stradling said it was, "one of the most important CDs we have ever produced! I hope you will agree." While I'm not really qualified to say - I'm not a music scholar or folklorist - I guess that may be true for several reasons but, for me, the more relevant point is that it is great fun! Listening to the rich chuckling voice of Bill Smith is a truly joyous experience. Despite his age (he was born in 1909 and recorded in the late 1970s) his voice is robust and his love of singing is (with a couple of exceptions) clearly evident. Whether it's a little rhyme remembered from the school playground or an ancient Child ballad his delivery is always full of life and humour. Amongst the songs there are a few conversational pieces. Comparing the old-fashioned 'singing pub' with the then-fashionable Folk Club, he says the men in the pub would be far more strict about respectful attention to the singer. 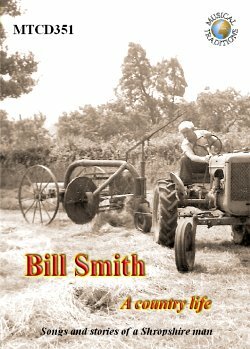 He also tells a couple of stories about his early life that give an insight into the regional culture, aspects of which can still be seen in rural communities, at least in those parts of South Shropshire that I know well. You can read complete transcriptions of these stories along with a full biography, Andrew Smith's notes about how the recordings were made, the lyrics and Rod Stradling's notes on the songs elsewhere on this website. You will find a score of songs that most of us these days would consider to be 'folk standards' such as Banks of the Sweet Dundee, The Cuckoo and All Jolly Fellows that Follow the Plough. Some of these are noticeably different from other versions that I've heard on record or in live situations in Shropshire. There's also a few 'ballads' including Barbara Allen, The Outlandish Knight and Henry My Son; a few 'tear-jerkers' such as The Children's Home and Will the Angels Play Their Harps For Me, and a dozen or more 'Music Hall' songs and adaptations such as Tommy Suet's Ball (aka Billy Johnson's Ball), Down the Road and In These Hard Times. There's a handful of stories and jokes, lots of recited snippets and parodies - silly songs and rude rhymes - and quite a few 'miscellaneous' or 'impossible to categorise' pieces. And these are precisely the things that you won't find in most other collections or, at least, not in these quantities. Rod points out that Steve Roud had to allocate no fewer than twenty-one new Roud Numbers for items you'll find on this CD. How one rates their quality is beyond my expertise, though generally speaking, I would not put most of them in the highest rank. Many of them are just a few verses so are difficult to compare with the longer and more complex stories we get in other versions. Some of the tunes are less complex too (for example, compare his version of Creeping Jane with the well-known version by Joseph Taylor) and, to some musicians, this may make them less interesting. I quite like the way that the story becomes clearer when stripped of musical ornamentation - but I have to admit, I still prefer listening to Joseph Taylor's version. Rod explains, 'When I published the first MT CD, back in 1998, I realised that it was really rather important to include as much as possible of a performer's recorded work ... I believe that only this approach affords the performers the proper respect they are rightfully due.' Now I agree with that sentiment whole-heartedly so, while this collection may not be completely unmediated, I would say it's as close as you're likely to get. Like Bill, my mother had a very eclectic repertoire - popular songs from the thirties and forties; half-heard snippets of current (1950s) hits, advertising jingles, bits of hymns and choral pieces such as The Messiah and, occasionally, 'old songs' such as Lord Bateman. I started to 'collect' her songs almost too late - she couldn't remember all the words or sang them to the wrong tune - and, of course, I wasn't interested in the pop songs and hymns. I wrote down what old songs she could remember but, even though I wanted to preserve them, that was all. Although I occasionally recorded songs from 'proper' folk singers at festivals and folk clubs, my tape recorder was mainly used for recording songs off the radio! Fortunately, Andrew Smith not only had the desire to preserve the songs, he used the technology available. Oh, how I wish I'd done the same! Of course, these tracks were recorded on home-recording tape machines and are very variable in recording quality. There's two tracks recorded in 1958 (made by Andrew's uncle) that are wonderfully alive because there is some audience reaction and Bill sings with a lovely twinkle in his voice, but there is also a lot of tape recorder noise. Those recordings made around 1978 are better quality but a few years later the fact that Bill was 'a reluctant performer' is sometimes evident. On several tracks there are household sounds in the background which some people may consider to be defects. I find them interesting, in that they give some clue about the circumstances in which the recording was made, or amusing (my own favourite is the chiming clock in McCafferty, "when barely heigh[bong]-teen years of age" with Bill pausing slightly before continuing the word). However, the vast majority of these tracks capture simple, straight-forward, heart-warmingly amiable performances of some lovely songs and stories; a father sharing his heritage with his son.